During the early ’60s, Teshigahara’s movie Woman in the Dunes played at New York art house cinemas. Based on the Kobe Abe novel, the movie concerns an entomologist trapped in the infernal world of a woman who is a slave to the sand in which she lives. Sand is the perfect medium for the Sisyphean struggle that the film portrays, since there is so much of it and the task, the metaphoric mountain the film sets out to climb, is ultimately impossible to fulfill. But there was another level to the film, that of the bleak landscape of nuclear Armageddon that Japan had faced only 17 years before. 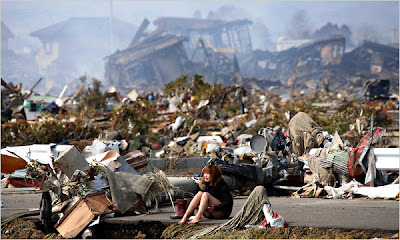 The recent Times headline, “Japan Reels As Toll Rises and Nuclear Risks Loom,” with its shot of a lone woman holding herself with her legs folded up against her chest against a background of burning rubble, was hauntingly reminiscent of both the feeling and the harsh world that the Teshigahara film evokes. The Times reports Japan to be a “$5 trillion economy, the third largest in the world” (“Death Toll Estimate in Japan Soars as Relief Efforts Intensify,” NYT, 3/13/11). Yet the earthquake, tsunami and ensuing nuclear meltdown have brought an advanced society to its knees. Powerful earthquakes have already caused extensive damage in New Zealand and there is a threat there of a recurrence, even as Japan still suffers from aftershocks. But what makes matters exponentially worse is the man-made problem of deadly radiation from cesium-137 and iodine-121. As David Sanger and Matthew L. Wald so eloquently summarized in their Times story, “In a country where memories of a nuclear horror of a different sort in the last days of World War II weigh heavily on the national psyche and national politics, the impact of continued venting of long-lasting radioactivity from the plants is hard to overstate” (“Radioactive Releases in Japan Could Last Months, Experts Say,” NYT, 3/13/11).